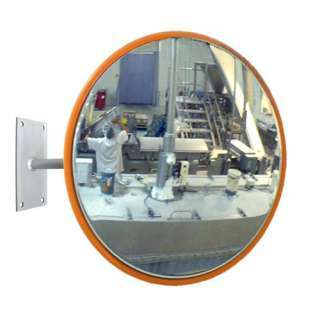 By installing these DuraVision™ Food Safety Mirrors, processing can be closely supervised, reducing costs in production, blockages and jams and at the same time, improving workplace safety. DuraVision™ convex food processing mirrors are a customised solution for the food production industry with the Stainless Steel Food Safety Mirror range and Stainless Steel Some Mirror range. A DuraVision™ unbreakable food grade mirror meets the stringent food processing hygiene and safety criteria, such as those prescribed by 3-A Hygiene Standards. Food processing safety mirrors are made entirely of Stainless Steel, and will withstand the harshest food industry conditions and cleaning regimes. 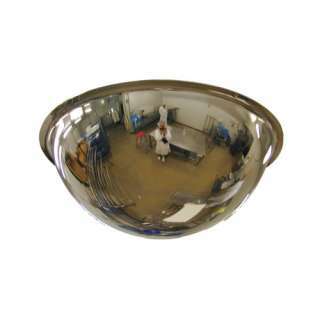 The highly polished stainless steel food safety dome mirrors are ideal for preventing collisions and for monitoring machinery and food processing equipment.